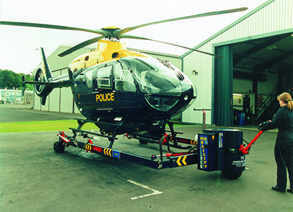 An innovative product had been designed and developed by a talented local engineer, a universal helicopter ground handling unit. These designs had to be turned into a manufactured reality, built not only to the highest quality, but also at a marketable price. After discussing the project with many engineering companies, it was Polydon who came up with the right answers. Initially our production engineers converted the ideas into working drawings, the blue print of success. The designs were modified where necessary using our production expertise to make the product suitable for batch production. All departments in Polydon contributed to this project. The leg assemblies are fabricated from hollow section and various formed brackets. Our CNC laser profiler cut the main drive and battery housings, which are then formed and fabricated into sub assemblies ready for painting and final assembly. The result was a competitively priced quality product which performs well in its specialised niche market and is in constant demand. The true result - success for all concerned.